Excursions, workshops and an art installation with Arlene Tucker and Susanne Palzer. Thursday 21.9. workshop for children, from 10:00 to 16:00 at Oranssi High Room. Sunday 24.9. workshop for adults and children, from 14:00 to 16:30 at Oranssi High Room. We invite Pixelache festival visitors to come on a playful collaborative excursion around Suvilahti where we will explore our subjective perceptions of the shared environment, record descriptions of what we see and collect relevant material. We will then return for an indoor workshop to create a 'hypertext' installation from the descriptions and found materials, making new connections and new artwork. Translation is Dialogue (TID), an ongoing project started in 2010, is based on how the translation process is a communicative act and creates dialogue within itself. This exchange allows transcendence of oneself or object to another. Regardless of the situation happening organically or consciously it is bound to the subjective state of the translator, yet it is through such discourse where realizations can be found. Exploring Hypertext is the eleventh phase of the continuously growing Translation is Dialogue curatorial project. TID: EXPLORING HYPERTEXT creates a space for people to record verbally what they see in their immediate location and share it with the international community. These recordings are immediately uploaded to the TID: Exploring Hypertext website where they are open for everybody to listen, contextualize and realize according to their own perception. People can listen to these descriptions and draw what they imagine. Thus, creating more points for hypertext links. The aim is to bring attention to local environments and the way we perceive spaces in different mediums and forms. In the end, by creating such a self-organizing system, we would bring together our worlds through sound, image, and associations. 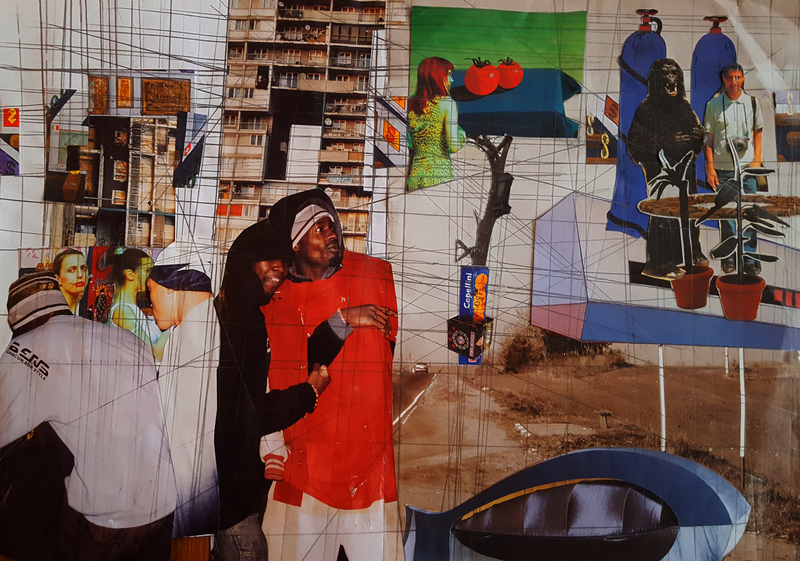 Collectively creating a collage allows us to piece together all perspectives and develop an ever-evolving environment of its own. It seems like computational processes run every aspect of our contemporary lives. The world wide web uses hypertext concepts - a software system that allows extensive cross-referencing between related sections of text and associated graphic material. Hypertext is complex and non-linear. Hypertext does not replicate the workings of the mind but resonates how we continuously associate and cross-reference trying to make sense of this world. A myriad of locations and micro-locations, different people, different languages, individual perceptions, interpretations and translations: TID: Exploring Hypertext represents our global connected world but puts human, local and embodied experience at the centre of the network. Arlene Tucker is an interactive installation artist and educator interested in adding play elements to daily life through her art. Inspired by translation studies, animals and nature, she finds ways to connect and make meaning in our shared environments. Her artworks create spaces for dialogue to be opened and to be divulged, making way for interpretations, discoveries and surprises to flourish. Originally from Taiwan and USA, Arlene has been living in Helsinki, Finland since 2011. Susanne Palzer is a cross-disciplinary artist, researcher and performer based in Sheffield, UK. Her current practice investigates the intersection of digital and analogue forms, in particular the fusion of digital technology and physical performance. She is the curator of OPENPLATFORM/RAP(s)-TwT., a micro event that explores the digital with physical means by asking performers to present digital work without using anything digital. Susanne is a co-director at Access Space, Sheffield.